Synopsis: A bag of noodles, a box of rice...we've got over 60 tasty, thrifty ways to fix them! Warm up with a bowl of cheesy wild rice soup and round out a meal with rice pilaf or farmhouse egg noodles. 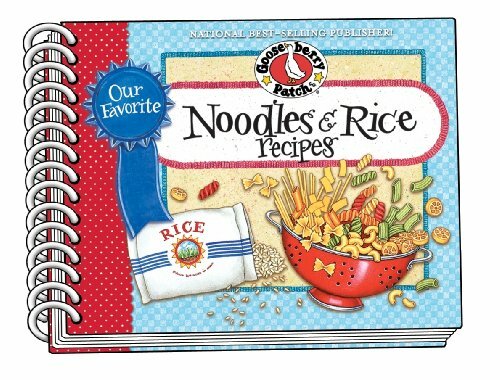 Purse-friendly size cookbooks makes meal-planning on the go easy. About the Author&colon; Back in 1984, Vickie Hutchins and Jo Ann Martin, next-door neighbors raising their families in the little town of Delaware, Ohio, started Gooseberry Patch. They were two moms with small children looking for a way to do what they loved and stay home with the kids too. They shared a love of home cooking and making memories with family & friends. After many a conversation over the backyard fence, Gooseberry Patch was born. They put together the first catalog & cookbooks at their kitchen tables and packed boxes from the basement, enlisting the help of loved ones wherever they could. From that little family, Gooseberry Patch has grown to include an amazing group of creative folks who love cooking, decorating and creating as much as Vicki and Jo Ann. Hard to believe it's been over 25 years since those kitchen-table days. Today, Gooseberry Patch is best known for homestyle, family-friendly cookbooks. They love hand-picking the recipes and are tickled to share their inspiration, ideas and more with you. One thing's for sure, they couldn't have done it without their friends all across the country. Whether you've been along for the ride from the beginning or are just discovering Gooseberry Patch, welcome to the family!